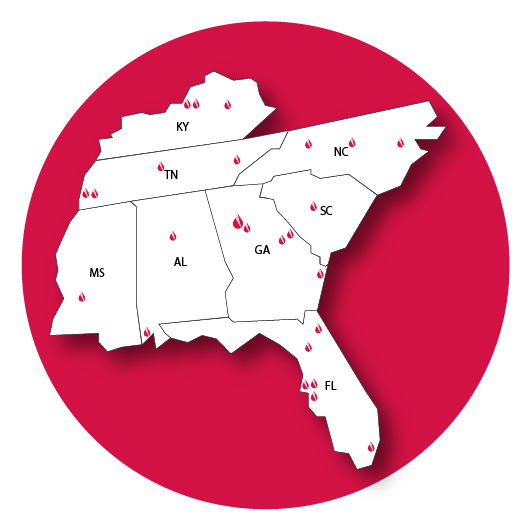 The Southeast Region Bleeding Disorders Program is a network of twenty-two federally funded Hemophilia Treatment Centers that serve the residents of Alabama, Florida, Georgia, Kentucky, Mississippi, North Carolina, South Carolina and Tennessee. The Southeast Region receives federal funding from the Maternal and Child Health Bureau and the Centers for Disease Control and Prevention to provide comprehensive care and prevention services to persons with bleeding disorders. Hemophilia Treatment Centers (HTCs) are specialty prevention, diagnostic and treatment programs. The HTC's goal is to provide family centered education, state-of-the-art treatment, research, and support services for individuals and families living with bleeding disorders. A multi-disciplinary team of professionals delivers these services. The core team includes an adult or pediatric hematologist, a nurse coordinator, a social worker, and a physical therapist. HTC services include medical and psychosocial assessment and monitoring, home therapy teaching and monitoring, orthopedic evaluation, infectious disease management, physical therapy, dental services, genetic counseling, rehabilitation and support services. The HTC team works closely with local health care providers to meet specific needs of persons with bleeding disorders, as well as to enhance the overall quality of the person's life by assisting with the prevention and management of complications associated with bleeding disorders. If you or someone you know would like to receive more information and/or services related to bleeding disorder care, please contact one of the Southeast Region Hemophilia Treatment Centers.